I’m so excited to be bringing you my first ever video tutorial and to share with you how to make a Matchbox Chest. The overall size of the chest including the feet and handle is 4 ½” tall by 3 ½" wide. This chest would make a perfect gift (if you can stand to part with it). 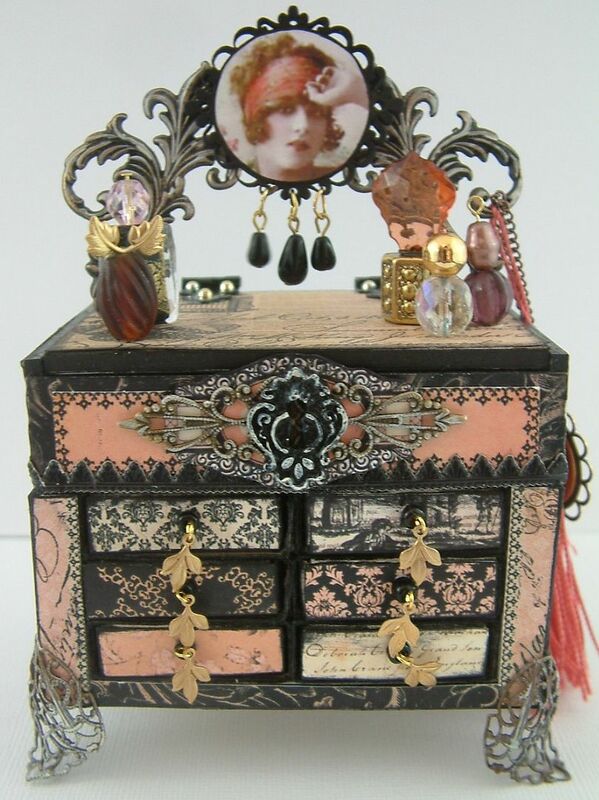 You can fill the drawers with love notes, candy, charms, jewelry or little pieces of art like Inchies. 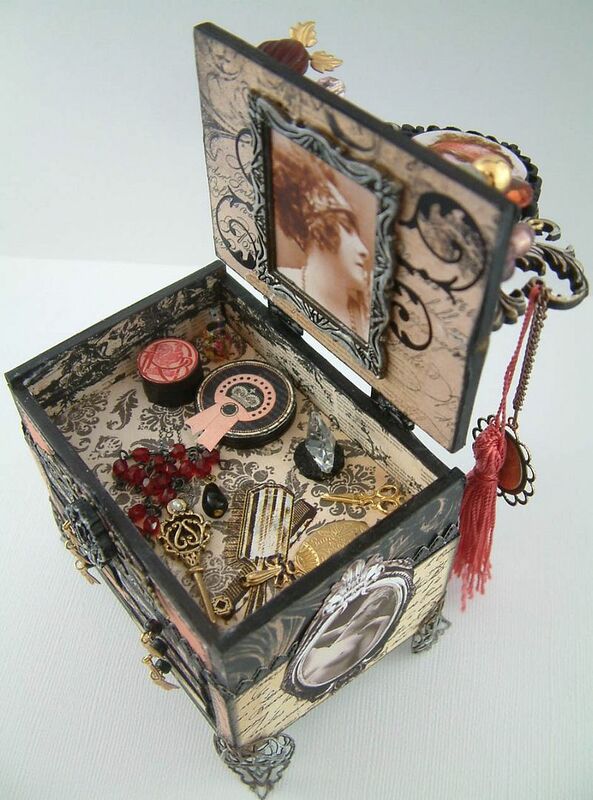 In the tutorial I’ll cover the supplies you’ll need and the steps to create this matchbox chest. 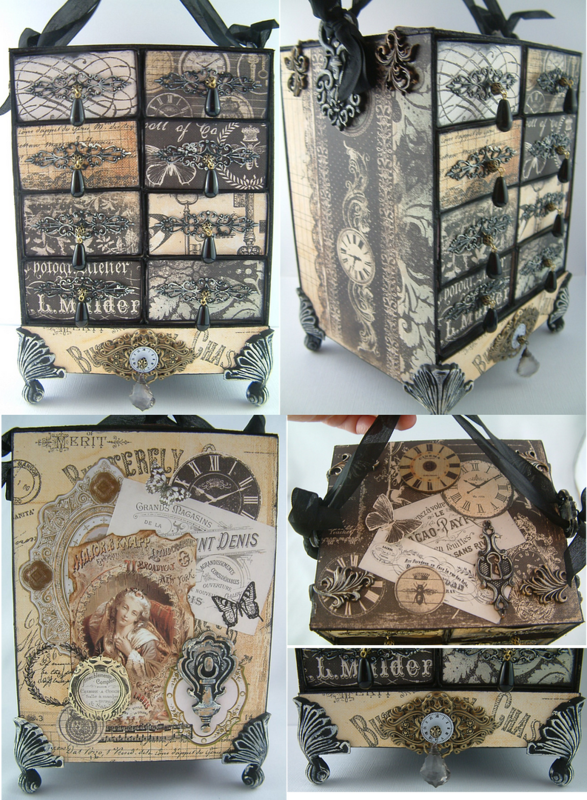 I’ve also created two other versions of the chest to give you even more ideas of what you can do with matchboxes. 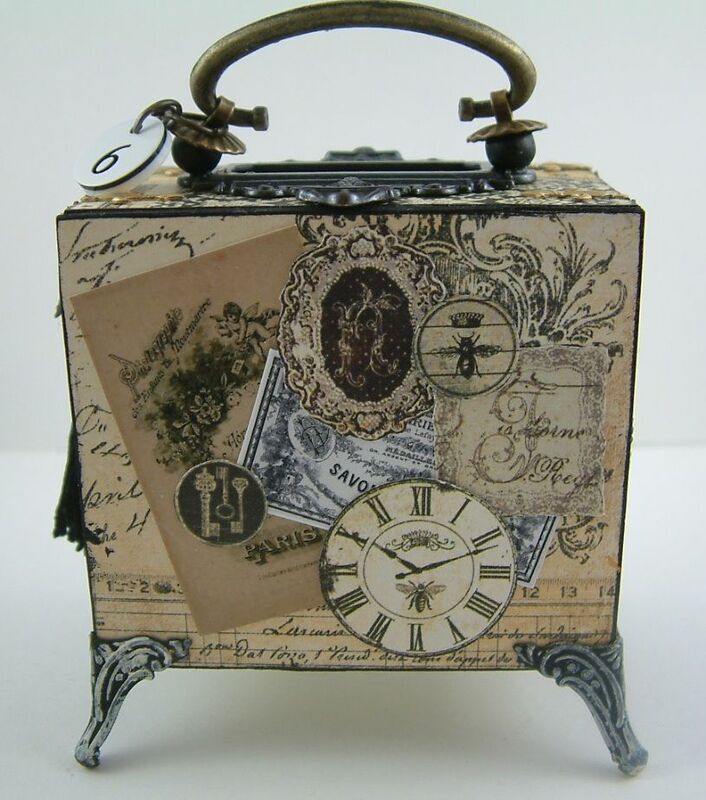 So sit back and relax and enjoy learning how to make a chest out of matchboxes. Be sure to watch part one before watching part two. As a companion to the video, I’ve created a PDF document that contains the supply lists for all three versions of the matchbox chest and the detailed instructions that are in the video. It’s really easy to scale the chest up in size. 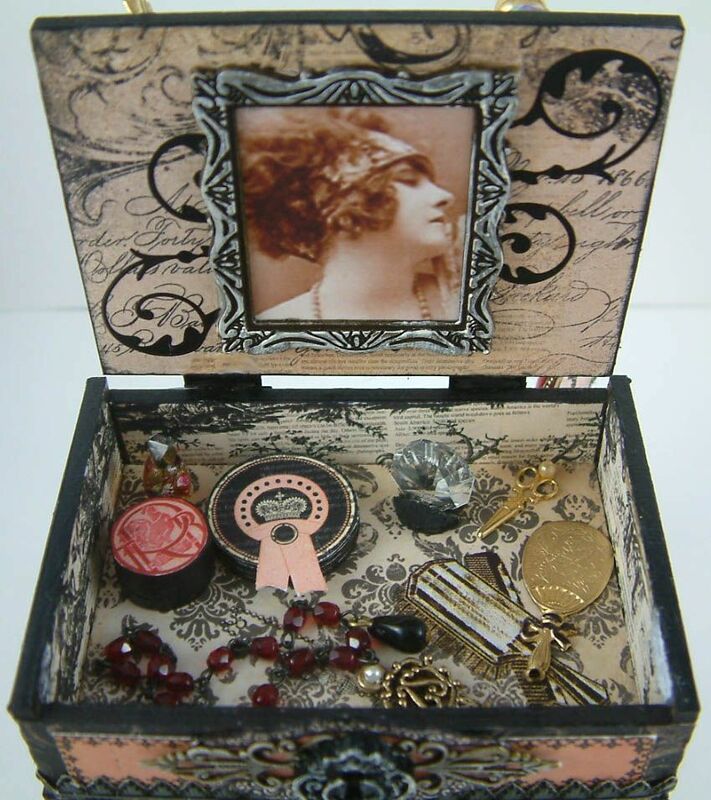 This larger version of the chest is very similar the small version except that I used matchboxes that measure 4 ½” x 2 ½”. This size of matchboxes is sometimes referred to a kitchen matches. The base is larger than the one in the small version. This is to accommodate the larger feet. The feet I used are no longer available but Alpha Stamps carries feet that would work great for a chest this size and I think they are even prettier than what I used. Instead of a metal handle I used ribbon. 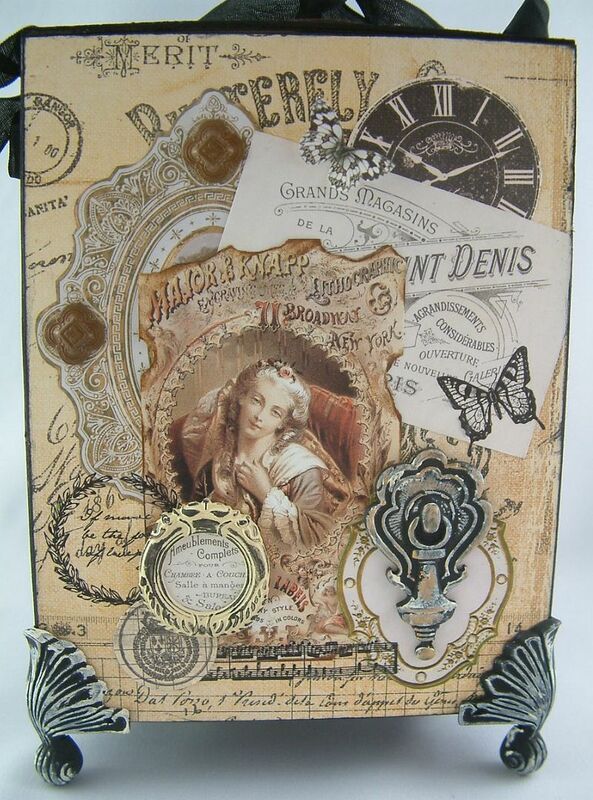 I’ve used some of the images from the new collage sheets on the top and back of the chest. 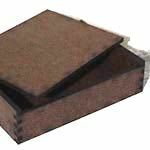 Foundations (Box Feet) - These are similar to the ones I used and are perfect for the larger chest. After creating the first chest I decided to build this version using a combination matchboxes and a tiny Masonite cigar box creating a hinged vanity. The overall dimensions are 6” tall by 4” wide. 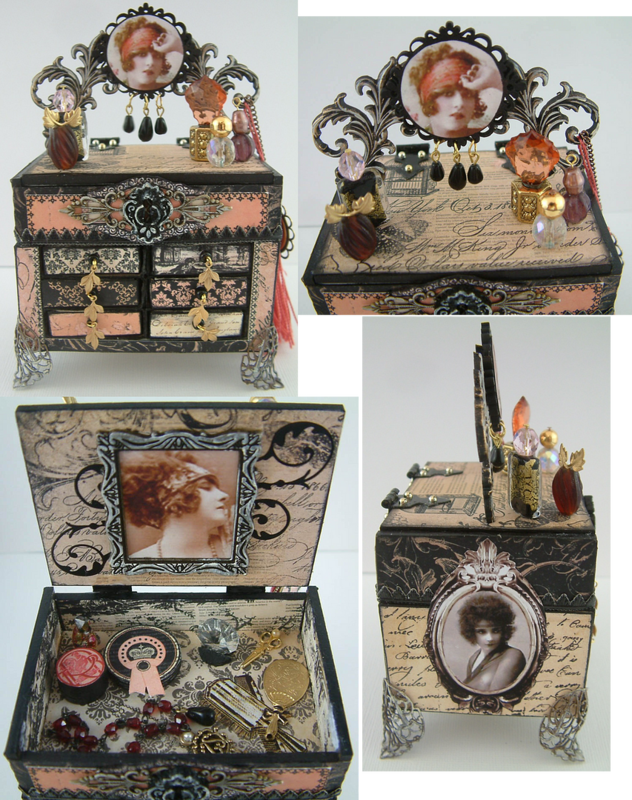 Inside the vanity you’ll find perfume bottles, powder boxes, brush and comb, a mirror, jewelry and a key to perhaps a secret diary. 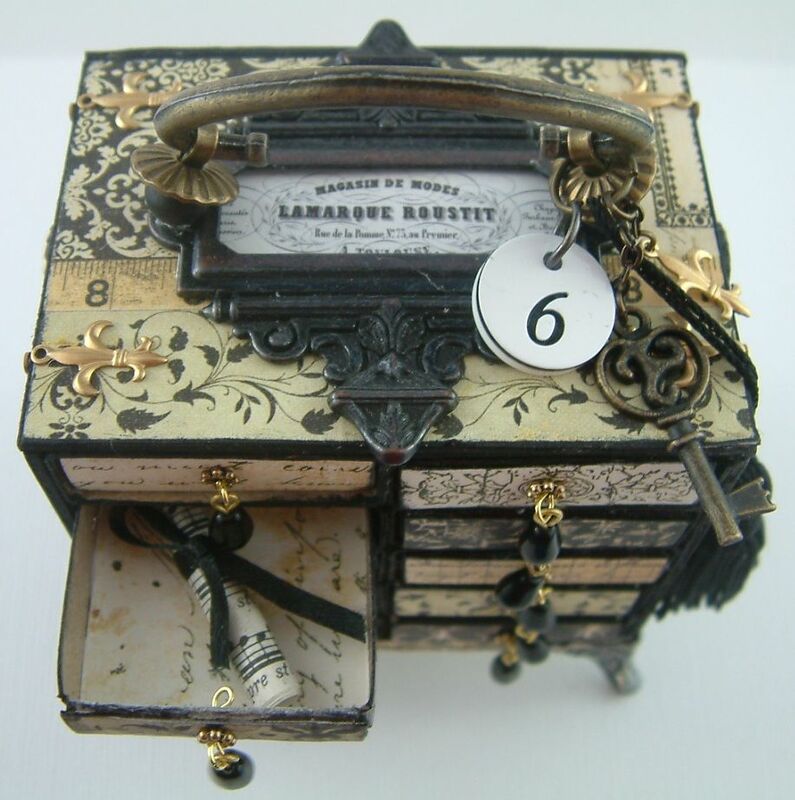 I hope you have enjoyed this tutorial and have fun creating your own Matchbox Chest!! OMG! Such an incredible pieces of art! I am speechless. Laura these are amazing! I loved the video tutorial and so appreciate you taking the time to do this for us. Pat yourself on the back! Your video tutorial was excellent, thorough and very professional looking. Great job, Laura. 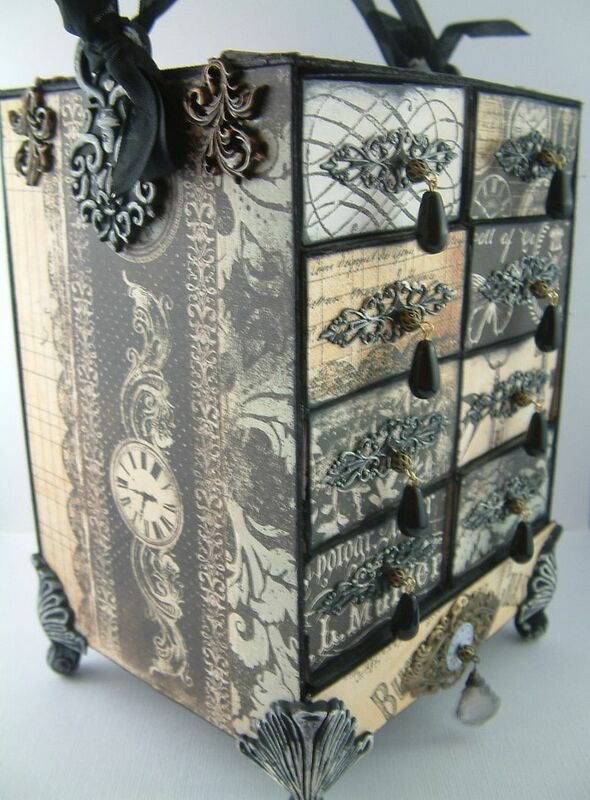 this is (like so many others) a most stunning piece, you can surely maKE fantastic creations, and this chest is a new example of that. How wonderfully and gorgeous made- I have not seen the videos, but will later. I`m sorry that I have not so much time to visit now, but follows you anyway, and come looking now and then, and am alwayes leaving with an applause for your wonderful creativety, and gorgeous creations. Laura, this is precious. I haven't watched the videos yet, but I think you for making a tutorial. I always appreciate it when an artists takes the time to share in this way. Very generous. Alpha Stamps should never let you go. OMG Laura! All of the matchbox chests are fabulous! Your talent never ceases to amaze me. Wonderful video tutorials - very thorough and easy to follow. Congratulations! Just awesome!! You have really outdone yourself this time. How absolutely amazing and gorgeous to boot! I haven't been around as much as I would like and I came by tonight to say...OMGoodness, this is amazing. 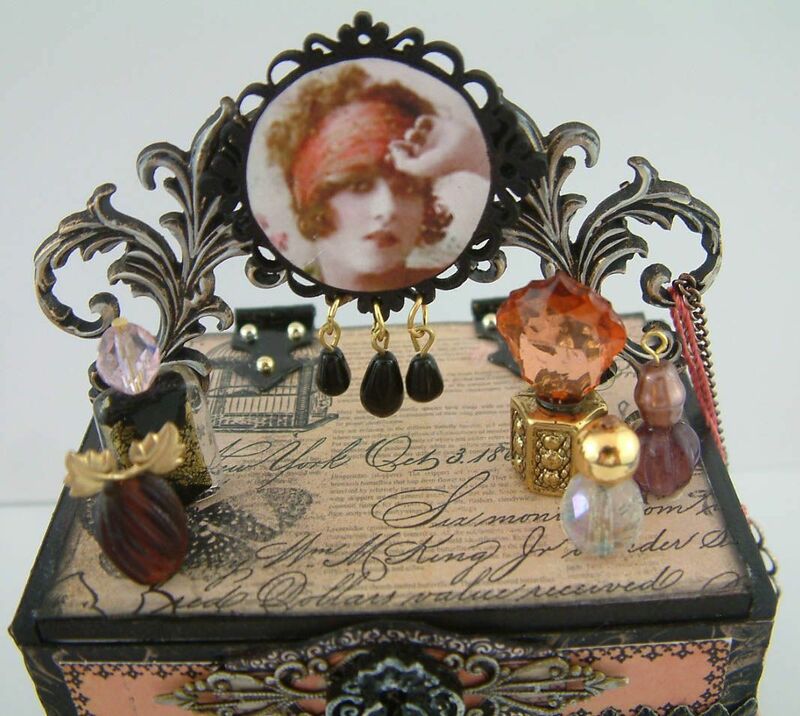 Laura you keep outdoing yourself with all these wonderful creations and thank you for sharing how to do them. I must put this on my to do list. Thank you for the PDF because I will never remember all the steps. These are just beautiful. You have definitely inspired me to think outside the box. Dear Laura, this box is absolutly wonderfull! Ces petites commodes miniatures sont splendides, félicitations, quel beau travail de minutie , de délicatesse et de classe. Laura this is simply an amazing video! You cover every detail so perfectly down to cleaning the E6000 tip! 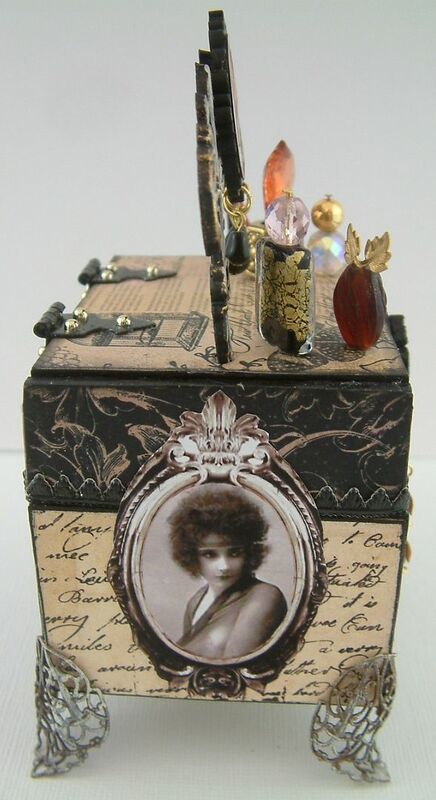 I love matchboxes and someday will gather up the courage to make your beautiful chest...thank you for all the inspiration. 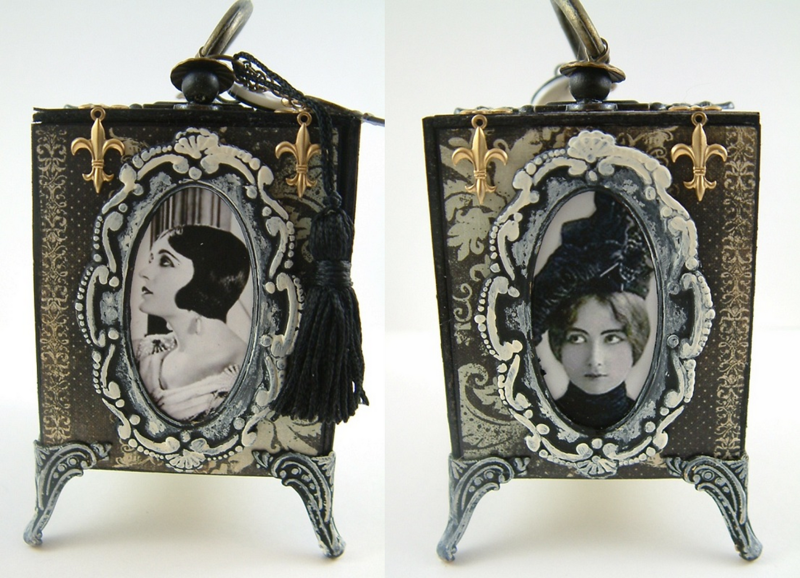 oh this matchboxes are perfect, I love them !! I have seen this fabulous tutorial of them and I am enjoying my journey around here so much! Your unique art work is gorgeous. Laura my friend, I´ve missed my words. I love them all. Everthing from you is a inspiration for me. Thanks for this tutorial. I hope I can make them. I write on my ToDo List. Thanks. What an amazing post! I watched the tutorial and I cannot wait to create one. Your instructions are just perfect. So lovely! My mother (now 90) was a miniaturist, so I grew up with tiny objects of beauty all my life. I showed her your matchbox chests and she thought they were so elegant. All I can say is STUNNING!! You my dear are a creative genius! Thank you so much for the wonderful video, the PDF, and your generosity!! Absolutely adorable! Thank you so much for the easy step by step tutorial. I will definitely give this a try. 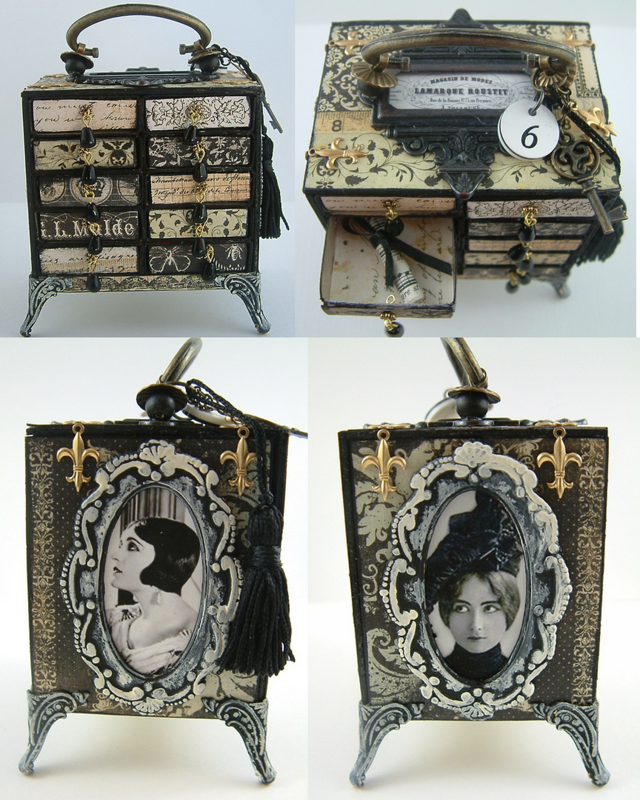 these are just marvelous pieces of art!! thanks so much for sharing ..the videos are great!!! What a fantastic and inspiring tutorial! I love the attention to detail and emphasis on avoiding mistakes. 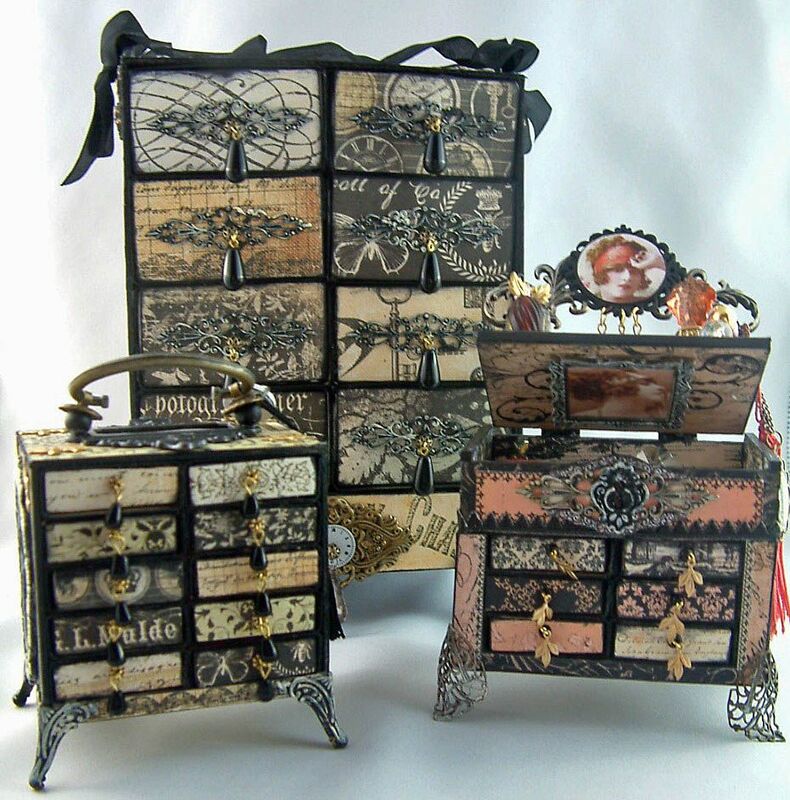 The chests are absolutely exquisite, thanks so much for taking the time to share the steps!!! I'm just flabbergasted! This is such a great turotrial, I actualy think I could make one of these. Thanks Laura! 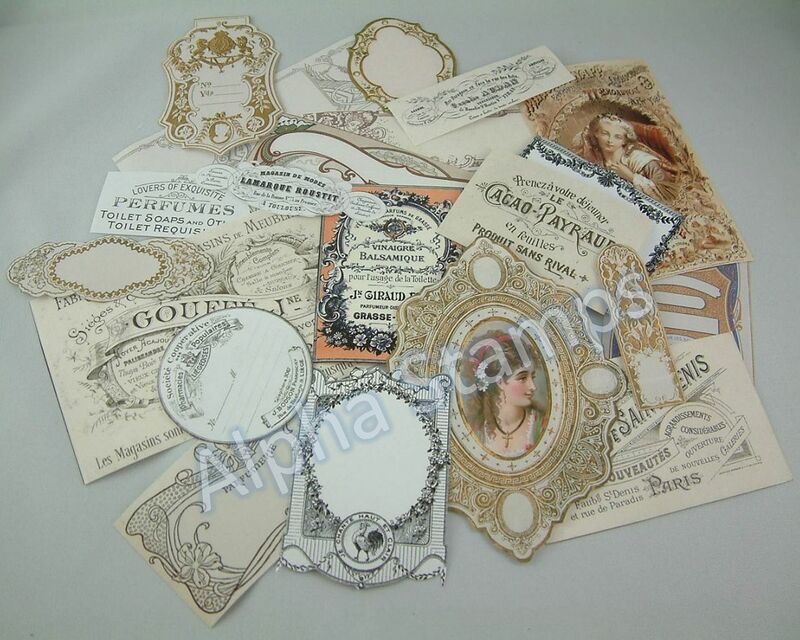 I've just watched the videos - wonderful - but yesterday I printed the pdf and ordered all the papers and bits and bobs from Alpha Stamps, today I managed to buy the matchboxes. Can't wait to start my matchbox chest. Watch this space for my version later in the year. Thank you so much for the tutorial. Oh my dear Laura, you have truly outdone yourself this time! This piece may be my favorite of anything I've seen on your blog (which is really saying a lot!!). Thank you so much for sharing this amazing tutorial and this jaw-dropping piece of art! You are so incredibly talented! I haven't had the time to watch the entire video yet, but I will! Absolutely fabulous, you are sooooo talented!!! This is so pretty! My daughter wants interesting objects that can be explored or played with on her wedding tables instead of flower arrangements, this is ideal. Thank you. I just have one thing to check on; when glueing the back onto the matchbox chest wouldn't it be better not to have glue all over, or the drawers pulled out slightly? Just so the the back of the drawer doesn't become fixed and the drawer canot be opened. I can't see how you avoided this in the video. I'll start by saying that I could this on Pinterest - don't you just love pinterest! 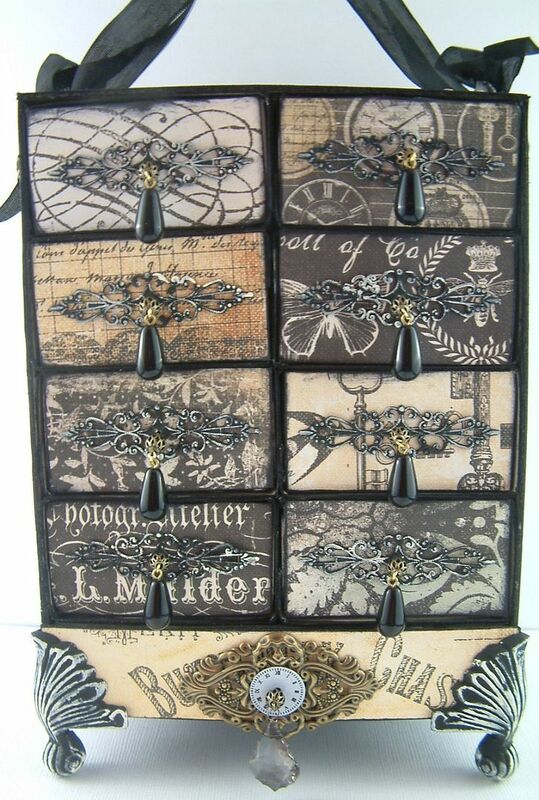 These are beautiful - I love all the details and I watched you videos and your directions are fantastic! 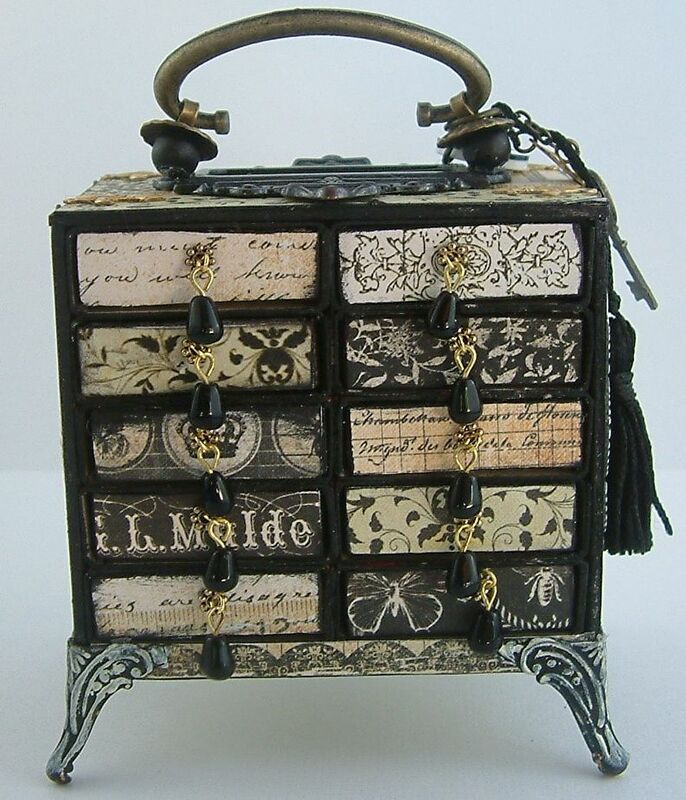 I want to make one with the larger match boxes - a place to story your trinkets and such... Fabulous, really fabulous! Laura I am speechless! This is absolutely beautiful! I love the concept and your eye for beauty!!! Wow can't wait to try your tutorial! Simply beautiful!!! 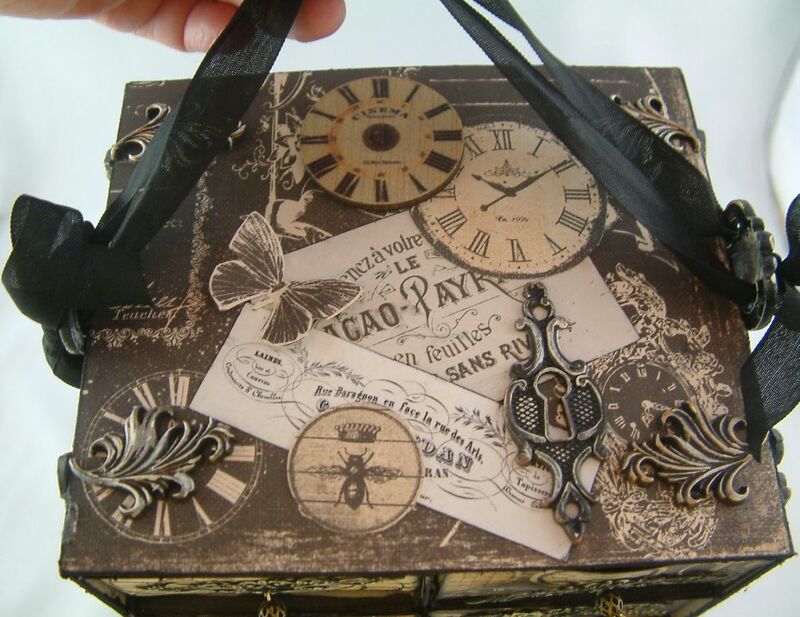 How beautiful-I love the details! Thank you so much for posting this with a video! Amazing! Hi I loved the easy to follow tutorial and set about making a mini chest...now all was fine, I measured carefully and took my time to make sure it was all square etc etc. My problem arose when I tried to pull out the drawers after I had glued on the back. In the video you glued the back on while the drawers were in the unit but surely that means that the backs of the drawers get stuck to the back hence not being able to be pulled out. Am I missing something here? Would appreciate a reply if you could please so I can master this fantastic project. I love it! Love the paper and the style. The entire thing just screams out my name. This would fit perfectly in a doll house. I'm so glad I did not start making my match box drawer chest before seeing your tutorial. I have so many ideas now. Thank you! The matchboxes and the paper to decorate it with I have. Just have to hunt down all the other needed things for it here in Sweden. Thank you for sharing! This is just beautiful, love this!